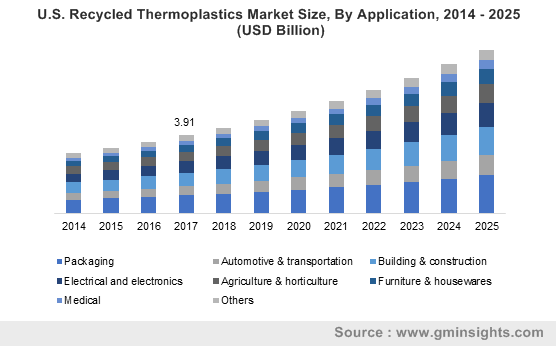 Recycled Thermoplastic Market size was estimated over USD 45 billion in 2017 and the industry will grow by a CAGR of more than 9.5% up to 2025. Population growth along with structural reforms taken by the government of developing economies has heightened the agricultural sector growth in Asia Pacific region, prompting the recycled thermoplastic market growth over the forecast timespan. India is the fastest growing agrarian economy with GDP growth rate of 7.7% for the first quarter of 2018 and it is highest among the last seven quarters. Agricultural sector of India contributes about 18% to the GDP and employs almost 50% of country’s population. Increase in agricultural income, improvement in trade patterns coupled with rise in investments in irrigation sector will boost agricultural output and will result in growth of recycled thermoplastics market as it is used in canal linings, mulching, green houses, low tunnel, sprinkle & drip irrigation systems. Post-consumer materials that are used as the feedstock for the manufacturing of recycled thermoplastics have the threat of contamination of chemical or microbiological nature. This makes them unsuitable to be used as the final food contact product in food & beverage industry and will be a key restraining factor for the recycled thermoplastic market in near future. 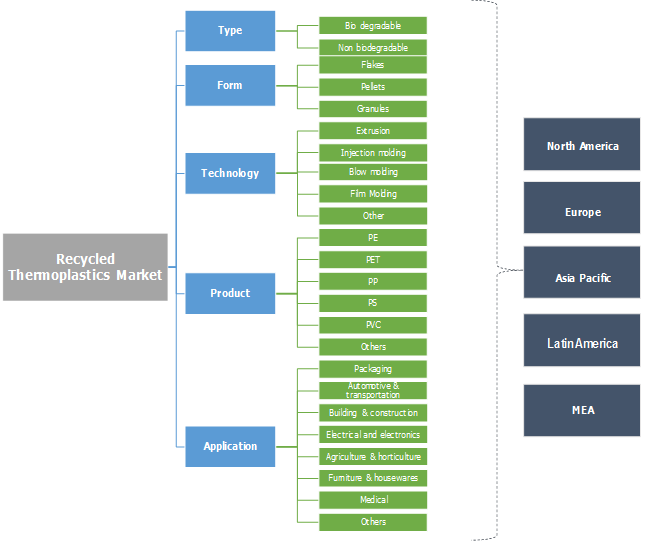 Recycled thermoplastic market is segmented into biodegradable and non-biodegradable. Among these, biodegradable thermoplastics was valued more than USD 40 billion in 2017 of the entire recycled thermoplastics market. Increasing R&D activities, rise in environmental awareness among the consumers along with implementation of strict environmental regulations are the factors that will continue to follow and will also show the positive growth in the product market in the forecast timeframe. In terms of volume, pellets accounted for almost 40% share of the global recycled thermoplastic market in 2017. The unique features of the product such as it can be easily embossed, tinged with various kind of colors, can be placed into molds to produce special or three-dimensional shapes makes them versatile. Flakes segment witness the decent growth with the CAGR of over 9% from 2018 to 2025. Recycled thermoplastic flakes are used in manufacturing of vascular prostheses, textile fibers, bottles, packaging straps, films etc. Global recycled thermoplastic market is segmented on the basis of technology which include extrusion, injection molding, blow molding, film molding and others. Among these, extrusion process accounted for almost 20% of the global share in 2017 and this trend is expected to follow as this technology is extensively used to manufacture several products such as films & sheets, fibre & filament pipes, profiles, etc. Based on revenue, the injection molding process will show the highest growth rate with more than 10% CAGR in the global market share due to advantage offered by this technology such as higher production rates, minimal scrap losses, repeatable high tolerances, etc. In terms of volume, polyethylene terephthalate (PET) accounted for more than 20% share of the entire recycled thermoplastics market in 2017. Properties of the product such as lightweight, strong, good impact resistance, barrier to gas, moisture make it suitable for manufacturing the packaging products such as bottles, pots, trays etc. Based on revenue, polypropylene (PP) segment was valued more than USD 7.5 billion in 2017 and will grow significantly by 2025. The product is widely used in automotive and electronics industry due its superior characteristics such as high stiffness, low density, resistance to heat, chemicals, etc. Recycled thermoplastics has wide area of application across industries among which building & construction contribute more than 15% of the global market share. The product has wide application in construction industry, mostly in interior design, piping, insulation, window frames, etc. due to its unique features such as durability, cost effectiveness, hygiene, sustainability, resistance to corrosion, ease of installation, use and maintenance etc. Building & construction sector is the major contributor to the GDP of Middle East & Africa region. This is all due to the large volume of construction projects being executed or planned along with the strategic initiatives taken by the government to boost the investors sentiments in the respective sector. This trend is expected to continue and will spur recycled thermoplastics demand in the forecast spell. Asia Pacific led the global recycled thermoplastic market with more than 35% of the global volume share by 2025. Demand for recycled thermoplastic is driven by the strong presence of the various industries such as electrical & electronics, automotive & transportation, building & construction, packaging, etc. in the region. Developing economies of the Asia Pacific such as China and India have shown strong growth in the sales of light vehicles by 13.7 % and 7.1% in 2016 respectively. This will positively influence the regional recycled thermoplastic market growth over the forecast timeframe. Based on revenue, Europe experienced a high growth rate of around 9.5% CAGR from year 2018 to 2025 owing to strong growth rates shown by the industrial and automotive sector due to the rise in exports and consumer spending, improving investor confidence and financial conditions. The region is led by Germany with over 15% share of the region supplemented by the presence of end user industries such as automotive & transportation, etc. Global recycled thermoplastic market is fragmented by the presence of several small, medium & large enterprises. Some of the major players in this market are KW Plastics, Plastipak Holdings, Inc., PARC Corporation, Clear Path recycling, B. Schoenberg and Co., Custom Polymers Inc., RJM International Inc., Suez SA, Merlin Plastics Alberta Inc., Ricova International Inc., JP Industrial, Revital Polymers, MRC, Replas. The companies are adopting several growth strategies such as acquisitions, opening of new plants along with the capacity expansion of the existing one to enhance their market share and gain competitive advantage. For an instance, in November 2016, Plastipak acquired business assets of Evolve polymers Ltd. which is a plastic recycler in England. This strategic step has strengthened the position of the company in the industry. Recycled thermoplastics are mainly used in the packaging industry due to its properties such as high strength, corrosion resistance, low density and user- friendly design. This has result in usage of the product as an ideal substitute for aluminum and other metals in the respective industry. Despite this, the product has application in various industries such as automobile & transportation, building & construction, electrical & electronics, agriculture & horticulture, etc. Increasing environmental concerns on the problems raised from incineration and landfill of plastic waste and these two are the most common methods adopted for the plastic waste management by municipals will result as a contributing factor for recycled thermoplastic market growth by 2025.